4th of July Wall Art Free Printable! 4th of July Wall Art Free Printable! Freebies and Printables for Patriotic Holidays, 4th of July, Memorial Day and Labor Day. AWESOME and Cheap Decorations! 4th of July Wall Art Free Printable! Easy and cheap holiday decorations for patriotic holidays and Parties! These freebies are a simple DIY t0 celebrate America! Super cute & PERFECT for 4th of July, Memorial Day, and Labor Day! If you are looking for cheap and simple decorations, be sure to check out these 4th of July Printables! All you have to do is print these out and put them in a frame! It’s so simple! These can go on your serving table for your 4th of July party or you can put them on the wall at your house! The options are endless because all you have to do is print and place! 4th of July is one of my favorite holidays. I LOVE celebrating with friends and family. We have a HUGE 4th of July party every year with food, fireworks, family, friends, and fun. It’s become a tradition in our home, so I am always on the lookout for cute and fun decorations. The thing about these printables is they are FREE! If you already have a frame at home, just replace one of your pictures for the holidays. It’s super affordable and so cute! If you are looking for more 4th of July Party Decorations, here are some of my favorites! Plus, here are some of my favorite 4th of July Party Recipes! I can’t wait for you to print these and display them in your home! I would love to know which of these printables is your favorite! I love the Land of the Free the best, but I think they are all super cute! Plus, here are even more 4th of July Crafts and Ideas! Have fun celebrating this year! Free Printable Spring Cleaning Checklist! Most the country is covered in snow and has cold temperatures right now and Spring is just a far off place that can’t come soon enough. But it will be here before you know it. And with it comes beautiful weather, flowers and the dreaded task of spring cleaning!! It can be a daunting task and it’s hard to know where to start. Today I have the ultimate spring cleaning checklist that covers just about every room in the house. This spring cleaning checklist is broken down by room. I also broke down the tasks to help it not seem so overwhelming. I tried to make sure to include items that we tend to forget about, but need a little TLC every now and then. Right now when you place your first $20 or more Grove Collaborative Order you’ll get $30 worth of FREE PRODUCTS! 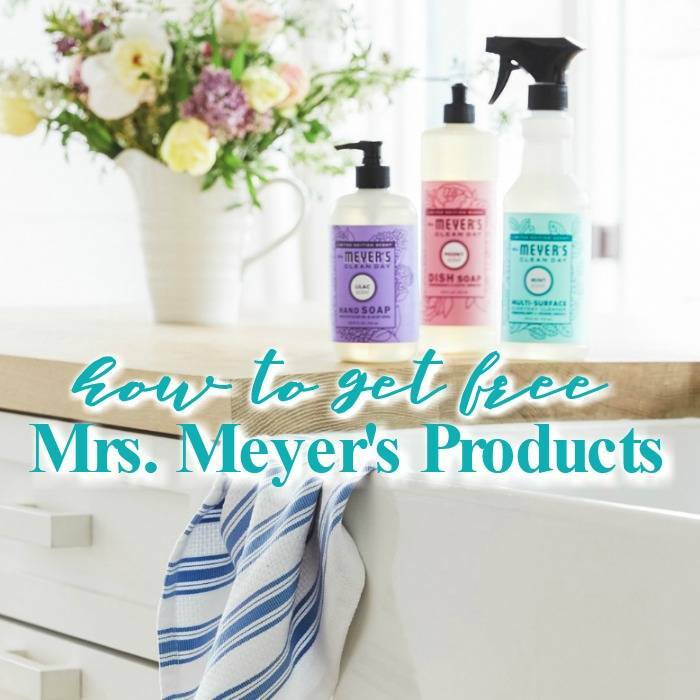 Including a FREE Mrs. Meyers® Hand Soap, FREE Mrs. Meyers® Dish Soap, FREE Mrs. Meyers® Multi Surface Spray and FREE Dish Cloths! Do you do spring cleaning at your house? What other items would you include on an ultimate spring cleaning checklist? Don’t Forget to pin the image below to share with your friends! St. Patrick’s Day Free Printables! St. Patrick’s Day Free Printables! Rainbow Seeds and Leprechaun Gold and Kisses! FUN and creative treats for kids for St. Patty’s day and class parties! These St. Patrick’s Day Free Printables are SO CUTE for St. Patty’s Day! FUN ideas for your kids to take with them to school or class parties! Maybe this is your year to host a St. Patty’s day party and we can help! My kids LOVE this Leprechaun Bait. I don’t know why, but they just think it is so funny! All you need is some Lucky Charms or this St. Patrick’s Day Cereal and the FREE Printable! Click here to print it now! I think this one is SO FUN! Leprechaun Gold is an EASY Treat for kids (or adults) this is one you can take to the office and share with your co-workers! A fun way to celebrate with a yummy treat! Click here to print it now! Leprechaun Kisses are a fun (and easy) way to say Happy St. Patrick’s Day! Super simple and FUN for kids! I mean, who doesn’t like chocolate!? Click here for this FREE Printable! Rainbow Seeds are another one of my favorites! HOW CUTE ARE THESE?! My kids Love this one and can’t wait to pass it out to their friends and teachers! Click here for this FREE Printable! I hope you have as much fun as we do with this Holiday! It’s all about rainbow and green!! Plus, here are even more of our favorite St. Patrick’s Day Crafts and Recipes! I have some AWESOME Easter Countdown Calendars & Free Printables that you can try today, just in time for Easter! These are super fun and the kids will love them! You can grab some of these great Egg People Easter Printables and grab some eggs to make egg people! Check out this great Printable Easter Countdown you can grab for your kids! I love this great Easter Printable Banner that you can hang up this Easter in your house! Here is an awesome Free Printable Easter Mask to grab for the kids! This is a super fun and easy Easter Bunny Countdown that will be a big hit! You can make one of these great Easter Story Countdowns to share the story of Easter with your whole family! The kids will love these awesome Printable Minecraft Egg Stands, they’re great! This is a fun game you can play with the whole family, grab your Easter Bingo Printables today! If you’re making brownies for dessert this Easter, you can grab these Easter Bunny Printable Topper! Here is an idea for an awesome Egg Countdown Calendar, check it out! Here is a fun idea, you can grab these Easter Printable Countdowns and let the kids fill them in! You can add some fun in your kids Easter Eggs this year by adding in these fun jokes! Grab these Printable Easter Cards and write some notes in them for Easter! Here is a fun Easter Printable Word Activity Sheet for the kids this Easter! Grab this awesome Easter Color by Numbers Printable Sheet for coloring or painting! Here is a super fun Easter Egg Cookie Sheet Countdown, it’s adorable and easy to make! This super fun Easter Window Frame Countdown Calendar is fun and you can fill the eggs with fun little prizes for the kids! Here is another fun Easter Printable Countdown Calendar that you can put wherever around your house this Easter! I am loving this super fun Bunny Kiss Easter Countdown and your kids will too + CHOCOLATE, you can’t beat that! Now that Valentine’s Day is over, I’m switching gears into St. Patrick’s Day projects and creating a St. Patrick’s Day printable. I never really used to do anything for St. Patrick’s Day. No green decorations or four leaf clover projects. It wasn’t until I started having kids that I decided how much I really like St. Patrick’s Day. I think the main reason is because of this word: LUCKY. Often times I stop and think about how lucky I am. I’m lucky to be a mom, a friend, a sister, a wife, etc. It’s one of my most favorite words. 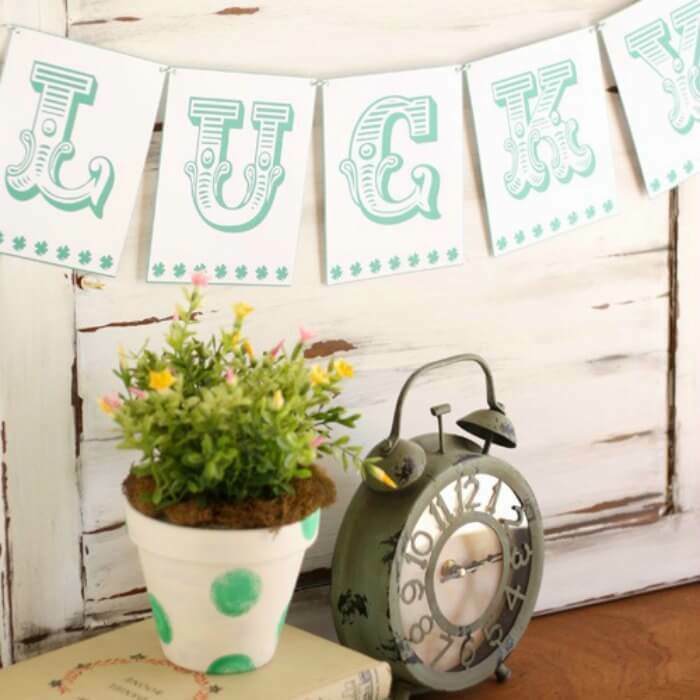 I love to display uplifting words or phrases around my home and thought this free printable lucky banner was just perfect to add to my St. Patrick’s Day decorations. I love how simple printables are to use in decorations. They add the perfect touch sometimes. This St. Patrick’s Day printable actually includes 2 shamrock flags as well as the word LUCKY. Are you feeling lucky this season? I sure hope so! Maybe we should all wish a little Magic into our lives.